During his third combat tour on May 27, 2011, Air Force Tech Sergeant Daniel Fye, an Explosive Ordnance Disposal (EOD) Team Leader with the 466 Bravo EOD Flight, was severely injured in an improvised explosive device (IED) explosion during a route clearance mission in Mushan, Afghanistan. The blast resulted in the loss of his left leg and severe damage to his right. 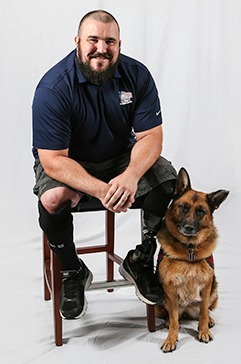 During his three-month stay at Brooke Army Medical Center in San Antonio, Dan underwent multiple surgeries for his amputation, burns and several limb salvage procedures on his right leg. After his release, he endured three years of physical therapy. He now wears a prosthetic on his left leg and a brace on his right leg. These days Dan can be found in the garage working on cars, in the gym lifting weights or at home spending time and traveling with his four children and wife Nicole. While he may lead an active lifestyle, there are several challenges he faced in his previous home. His Homes For Our Troops home with an accessible bathroom, he says, makes daily life more comfortable and “less of a chore.” Having the financial burden of a mortgage eliminated, he says, opens up many doors for him and his family. He is now able to build a large, detached garage where he can work on cars. He would like to race cars and raise money for Veteran organizations. He has dreams of entrepreneurship too, and would like to build a home gym, where he could teach others with physical challenges how to weight lift. Since receiving his home, Dan achieved his lifelong dream of becoming a firefighter. He graduated from South Sound Fire Academy on Vashon Island in November 2018 and is planning on attending EMT school. He says the freedom and independence he regains in his HFOT home has made this dream possible. “Going to the gym and the Fire Academy training can take a toll on my body. The comfort of my home allows me to recover enough to keep pushing myself,” he says. Originally from Northern California, Dan and his family choose to build their home in Bremerton, Wash. After being stationed in the area, he says it feels like home. Dan says the gift of a specially adapted home is life-changing. “Finally being in our forever home has given my family security knowing that we are finally home and can begin to start rebuilding our new lives,” he says.